This is a novel gift idea for the the pizza lover! You know how you always have to cut pizza twice to get a clean slice? Well, this Pizza Cutter's got two blades and a speedy race car look, so you can slice your pizza in half the time. Sure to be a great conversation piece at your next pizza party. 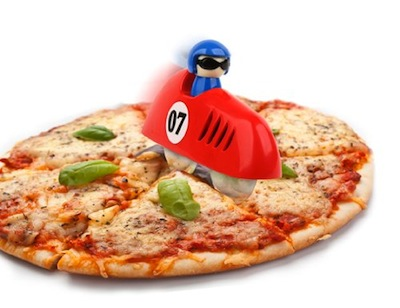 Double Bladed Pizza Cutter slices your pie with the speed & precision of a Formula One Race Car. 2 blades each measure 2.5 inches in diameter. Length of Race Car pizza cutter approx 6.75 inches. Height: approx 4.5 inches. Race Car body made of rigid plastic. Cutting Blades of Stainless Steel. Disassembles for easy cleaning. Dishwasher safe.